Dear Applicant, on the eve of 2nd round forthcoming NAAC Peer Team evaluation, it gives me great pleasure to invite you to take admission in an improved quality based institution namely Surendranath Evening College. 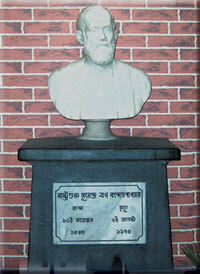 Keeping with the legacy of our founder Sir Surendranath Banerjee, a noted social reformer and educationist, our college is committed to imparting, sustaining and steering all-round holistic and quality education tom the students so that they gather knowledge and grow up as responsible global citizens of tomorrow. The college has recorded an innumerable constant development in infrastructure of learning to recognise itself as an educational excellence. The college has a green campus with aviary, aquarium, greenery plant and shrubs, canteen, separate ladies’ common room, with 24 hours CC TV observation. Besides, the college has ICT class room, seminar hall, well decorated assembly, computer based laboratory, N Listed Library, Internet based IT laboratory etc. The college focuses on improving the quality of teaching and learning. There have been a number of steps already taken towards this like power point presentation, ICT teaching and learning, training for competitive examinations, charts, graphs, videos etc. as far as possible. The faculty members also conduct seminars, group discussions, quiz contest etc. In class room to help the students and to make them well acquainted with curriculum clearly and to build them as well equipped students in global environment. We can boast of that Surendranath Evening College is the only one Govt. aided college in West Bengal who organizes compulsorily parents- teachers meeting to evaluate the progress of a student before appearing final examination and to give suggestions for the better improvement of students. It is indeed a unique privilege to our students to become a part of this college family. I convey my best wishes to all of you and family who chooses our college to admit in various degrees and make themselves as one of our family members. Thank you all with best of luck.